As the gentle reader would recall, Waukesha County and Teapublican poster boy, Bill Kramer, finally had his wild ways catch up to him when he was charged with sexually harassing and groping a woman. There was so much backlash about this that the Teapublicans tried to shove him back under the rock that he had crawled out from. He was laying so low that my Brother in Blogging, Jeff Simpson, was looking high and low for him. Well, Kramer has finally been found! He was busy cutting checks. No, not to his fellow Teapublicans, but to his defense attorney. 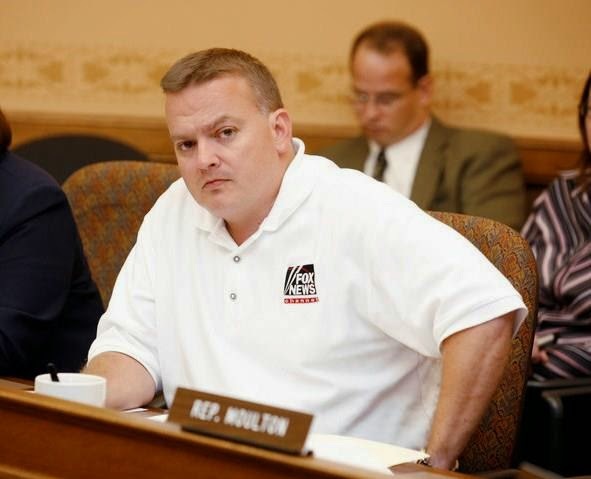 The campaign of embattled state Rep. Bill Kramer has paid $10,000 to defend him against sexual assault charges, raising questions about whether the payments violate state campaign law. State law allows politicians to use campaign funds for their legal defense, but only against allegations that they had broken election or campaign finance laws. Scot Ross, executive director of the liberal group One Wisconsin Now, said that sexual assault charges have nothing to do with election law violations. "How can Kramer use his campaign account to pay legal bills related to the sexual assault charges against him?" Ross asked. Reid Magney, a spokesman for the state Government Accountability Board, declined comment on the spending by Kramer's campaign. The board enforces state campaign finance laws and never comments on potential violations. It sure seems that Teapublicans have a problem understanding the rules around legal defense funds. Wisconsin Supreme Court (In)Justice David "Chokehold" Prosser also thought he could set up an illegal legal defense fund for his assault on Justice Ann Walsh Bradley. I blame the whole thing on Scott Walker, who blurred the lines by calling his legal defense fund a legal cooperation fund. He should know that his fellow Teapublicans get easily confused. And don't forget, even if the offense were such that he COULD transfer funds from his campaign account, he would need to get prior consent from each donor whose money he uses, and those names must then be disclosed. I've just been arguing this with Ed Willing over on Dan Bice's FB wall. don't blame walker for allowing people to illegally set up criminal defense funds -- blame GAB which stood down and at-least tacitly approved it. Perhaps someone should file an open-records request to see all of the internal documents at GAB related to this. GAB will not be the hero in the resolution of the ongoing john doe probes -- yes -- they may agree that there is no question that laws that have been used to prosecute others were broken. But that does not mean they are doing any more than trying to cover their butts now because the fellow republican swines they have uncritically supported appear willing to throw them under the bus and have filed lawsuits against them. Lawyers all know that they walk a fine line and have a professional liability for their action -- is GAB going to do the right thing and support the investigation and resulting indictments and convictions? Only time will tell -- until then -- best assumption is that they are covering their butts. What is obviously happening here is that out-of-state billionaires are using Wisconsin to create a legal crisis so that the SCOTUS will eventually eliminate any and all campaign finance laws. I doubt the intention was to use walker as their poster boy, but now they have no choice -- this moron blew their cover when he "dropped the bomb" and then got caught on camera admitting his political agenda was to "divide and conquer". The powers-that-be cannot be very happy with scottie, but they got in bed with him. What scottie hasn't learned yet, however, is that he is not the one calling the shots now. The out-of-state billionaires behind this will take care of walker as he continues to play-ball. However, no matter what the implications are to walker's political career, he is first-and-foremost the public face on their legal posturing to tee-up legal challenges to expand Citizens United. Don't forget the Van Hollen principle " It may have been illegal but wasn't criminal" if Republicans were caught doing it.